North Bedfordshire Heritage Trail - 2015 at BedfordWalking RouteThe Trail was devised by the late Gordon Edwards of the Ivel Valley Group of the Ramblers around the year 2000. This publication updates his work for the many changes that have occurred since then. His aim was to design a trail that attracted walkers from near and far to discover the underrated area of North Bedfordshire and its wonderful heritage. It is described in a clockwise direction, starting from St Paul's Square in Bedford and is a circular route of approximately 70 miles. Following existing rights of way throughout, the Trail visits no fewer than twenty three villages, two country parks and a reasonable number of public houses, so plenty of refreshment stops can be taken on the way. Many of the towns and villages on the Trail have a long history of settlement, in some cases going back to pre-historic times. 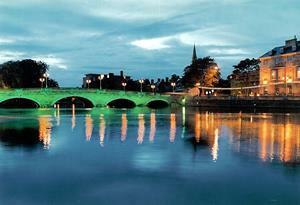 Bedford is easily accessible from the M1 junction 13 via the A421 or from the A1 via the A603. Parking is available in short and long stay car parks situated in the town centre. Start Description St Paul's Square in Bedford. The Trail was devised by the late Gordon Edwards of the Ivel Valley Group of the Ramblers around the year 2000. This publication updates his work for the many changes that have occurred since then. His aim was to design a trail that attracted walkers from near and far to discover the underrated area of North Bedfordshire and its wonderful heritage.